Metro released the draft environmental study today for a project that could potentially extend the Gold Line from East Los Angeles to South El Monte or Whittier. In addition, the study also looks at a Transportation Systems Management (TSM) alternative which identifies potential bus upgrades and the legally required no-build option. Click here to access the entire draft study, which is also known as the Draft EIS/EIR. The study process has been closely watched by communities along both potential light rail routes as an extended Gold line would provide an alternative to driving on the frequently congested 60 freeway or traffic in communities along the Washington Boulevard alignment. The two light rail options, shown above, would both begin at the Metro Gold Line Eastside Extension’s current terminus at Atlantic and Pomona boulevards in East Los Angeles. •The “SR 60” Alternative would extend the Gold Line for 6.9 miles to South El Monte with four proposed new stations. The train would run adjacent to the 60 freeway, mostly on aerial structures, and include four new stations serving Monterey Park, Montebello and South El Monte. •The “Washington Boulevard” Alternative would extend the Gold Line for 9.5 miles to Whittier with six proposed new stations. The train would follow the 60 freeway and then turn south, running on an aerial structure above Garfield Avenue until turning east on Washington Boulevard and ending near the intersection of Washington and Lambert Road. This alternative would serve Monterey Park, Montebello, Pico Rivera and Whittier. Estimated ridership for the SR 60 alternative is 16,700 boardings each weekday with a cost estimate of $1.271 billion to $1.296 billion in 2010 dollars, according to the draft study. Estimated ridership for the Washington Boulevard alternative is 19,900 daily boardings per weekday with an estimated cost of $1.425 billion to $1.661 billion in 2010 dollars. Metro staff plan to recommend a Locally Preferred Alternative to the Metro Board in November. At that point, it will be up to the Metro Board of Directors — who oversee the agency — to decide how to proceed with the study. Rail is seen as a viable alternative because work trips in the study area are expected to increase by 32 percent by 2035 and peak-period travel times increase 25 percent in the morning and 34 percent in the evening by 2035. Metro also says the area has a “significant” level of transit dependent, with 38 percent of the study area’s population under 18 or over 65 years of age and 16 percent of the households categorized as “low income.” Twelve percent of the households have no vehicles. The study — formally called the Draft Environmental Impact Statement/Report — is a legally-required document needed before any project can be built. The study considers the need for a project, a variety of project alternatives, potential impacts and mitigations. The draft study is a prelude to a final study that weighs public opinion and incorporates changes from the draft study. The expense of both alternatives is due, in part, to the long aerial sections required due to lack of space at ground level and/or narrow streets. The SR 60 alternative would run almost entirely on aerial structures. The Washington Boulevard alternative would use aerial structures along the 60 freeway, Garfield Avenue and parts of Washington. Funding for a potential extension of the Eastside Gold Line was included in the Measure R half-cent sales tax increase that was approved by 68 percent of Los Angeles County voters in 2008. Measure R is scheduled to provide $1.27 billion for the project. Metro often assembles funding from several local, state and federal sources to fully fund large transit projects. Under Metro’s long-range plan, the second phase of the Metro Gold Line Eastside Extension is not scheduled to be in operation until 2035. But Metro decided to move ahead with the draft study should funds be secured that would allow the agency to build it sooner. One potential source of funds would be an expansion of federal funding for transit projects through Metro’s America Fast Forward (AFF) initiative. Congress hasn’t made a decision yet on whether to expand AFF. The Metro Board of Directors has also discussed the possibility of a countywide ballot measure in 2016 that could possibly supply money needed to accelerate this project and others. Another Measure R project, the Regional Connector, is under construction in downtown Los Angeles and will be a 1.9-mile underground light rail line that connects the Gold Line to the Blue and Expo Lines. That will be significant for riders along the Eastside Gold Line — the Connector will allow for a one-seat ride into the heart of downtown without first having to travel to Union Station and transfer to the Metro Red/Purple Line subway. The Eastside Gold Line project has thus far proved to be an interesting reversal on the way transit projects are done in L.A. County. In years past, rail projects have often been heavily resisted by cities or particular neighborhoods — for example, until this summer, there was a state law prohibiting rail from being built along sections of the Orange Line in the San Fernando Valley. However, cities along both potential Eastside Gold Line alternatives have been actively championing the respective alternatives since they were first identified in earlier studies several years ago. The obvious upside is that community support makes it a lot easier to build and fund transit. The downside, in this case, is that there is not enough Measure R funds to built both light rail alternatives, and there would also be operational challenges involved in splitting service between two Gold Line segments. If the Metro Board of Directors decided to consider building both alternatives they would have to find a way to fund it. Even a potential new sales tax ballot measure in 2016 is challenging because of the two-thirds threshold it would need to be approved and an already long list of projects that are candidates for funding. 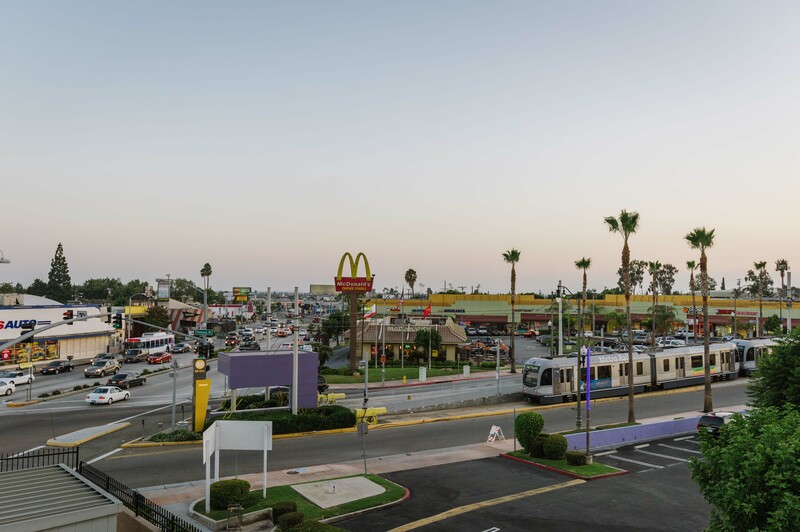 The project could potentially extend the Gold Line from its current terminus at Atlantic and Pomona boulevards in East Los Angeles, above, to South El Monte or Whittier. Photo by Steve Hymon/Metro. This is ridiculous to a point. There’s no reason they can’t complete a loop by building into Whittier first, and then building up the 605 freeway and then back to East LA. This would pass through South El Monte. Whittier should get the extension because they are poorly served by the transit. There’s only 1 Metro line that goes through Whittier, and a few Montebello bus lines that take forever to reach DTLA, and they don’t all run 7 days a week, and service shuts off relatively early on weeknights. South El Monte already has access to the the large regional bus depot at El Monte station. No reason at all except for the obvious: how to pay for it. There’s no estimate on what it would cost to complete a loop but just looking at the map it would seem that the cost would be at least as much as the SR60 alternative, if not more. If, as the article points out, there’s not enough future money to build both lines as proposed, how do you propose to find the additional billions that would be needed to complete the loop? Build BOTH and connect the SR 60 alternative to El Monte Station. The Washington alignment is roughly parallel to and about a mile north of the Metrolink OC/91 lines. I know that the rail line lies outside the study boundaries, but would it be a feasible alternative to add a couple of stations and upgrade Metrolink service? It’s double track from Norwalk to the L.A. River, so I’d think 20-minute headways should be possible, especially after the SCRIP run-through tracks get built. I think that Metro really, really, really needs to look at taking the southern path first and extending it down to the eastern Green line terminus (through Santa Fe Springs). This help tie the system together much better (busses and trains). Also, this could help take pressure off of the Blue line (so many people take the Green to the Blue to DTLA). Which ever choice is made, the plans should be set and the structures built with the line splitting in the future. I hadn’t even considered that connecting Yellow with Green was possible, and I agree that any connections would help strengthen the system. Hopefully they’ll consider doing this. I say build both lines. The question is which line to build first. I say build the Whittier line first then with future funding bulld the line along the 60 Fwy. What line would have the greater number of riders? As the article states, the Washington alignment would bring more riders, but also cost more to build. However, the cost per estimated rider is less than the 60 line. per estimated passenger according to the San Gabriel Valley Tribune article..